The Escape from Alcatraz Triathlon is a popular annual San Francisco Event. San Francisco Hotels like Hotel Union Square will welcome athletes from around the world who come to participate in the Escape from Alcatraz Triathlon. Could anyone have escaped from Alcatraz during its time as a prison? That question has been long debated with some experts saying no such escape was possible while others maintain that the three men who meticulously planned an escape, John Anglin, Clarence Anglin, and Frank Morris, could have survived the swim from Alcatraz Island to the mainland. This San Francisco Event gives participants the chance to swim in those same waters. Participants will begin their swim from the start boat, which departs Pier 3 at 6:30 a.m. on race day. 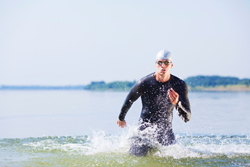 The 1.5-mile swim is followed by an 18-mile bike ride and an 8-mile run. The course is quite challenging, and therefore is not recommended for those who have not participated in a triathlon in the past. Festival Village will open the day before the race. That is when participants can pick up their packets and attend the athletes meeting. The Escape from Alcatraz Triathlon is capped at 2,000 participants. Those who missed registering had a second chance to compete by applying for one of the random drawing slots. Another way to take part is by teaming up with one of the charity teams that will participate in the San Francisco Event. More information about the charities and how to join one of their teams is available on the event’s website. Those planning a June visit to San Francisco can Check Rates and Make Reservations or call Hotel Union Square at 844.592.4560. Hotel Union Square’s guest rooms and guest suites feature thoughtful amenities including Complimentary High Speed Wi-Fi, On-site parking, Flat screen TVs, complimentary morning Coffee & Tea in the lobby, complimentary evening Wine Reception with a live acoustic guitar player, dog friendly (fees apply), complimentary 24-hour Business Center, complimentary use of a Fitness Center within walking distance & more. Hotel Union Square is an ideally-located San Francisco Hotel that is near top Attractions, Dining, Shopping, and San Francisco Events.